Here's a shot of my entry right now, complete with peeling red paint on my door. Have I mentioned that my entry and front room embarrass me whenever people come over? My goal is to have them presentable by my Christmas party, and even though we all know I'm a fan of inappropriately timed, last minute projects, I figure starting now might actually be a good idea. 5. Paint wall above board and batten treatment -- I'm thinking Benjamin Moore's Palladian Blue right now. 6. Sand, prime & paint the backside of the front door - white or gray? We'll have to cross that bridge once a bit more of the room is done so I can feel it out. 7. Built a narrow bench from these plans. 8. Makeover the closet door by creating some faux panels. 9. 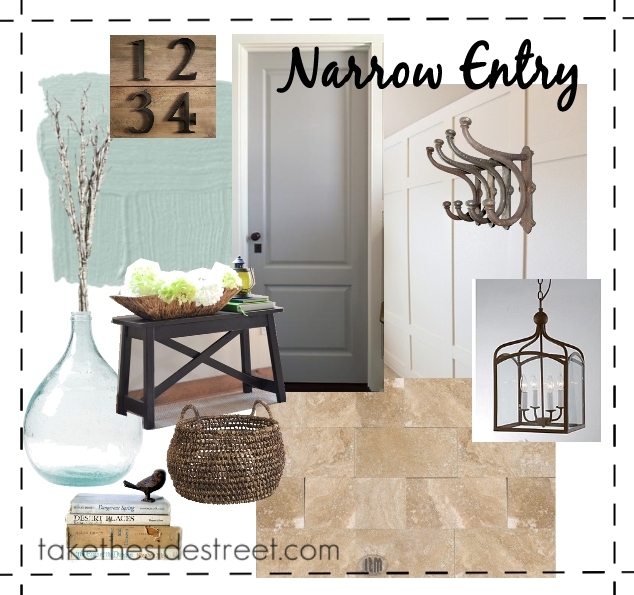 Install a new light fixture -- I'm loving the look of the rustic lantern in my design board, but we'll see. 10. Accessorize the space to decrease my guest-induced-shame. Your plans EXHAUST me. Just sayin'. I do think it will be positively lovely. Your ideas sound great! Have you thought about maybe building one panel on your closet door and painting the inside with chalkboard paint? You could us any color of chalkboard paint for the inside panel. 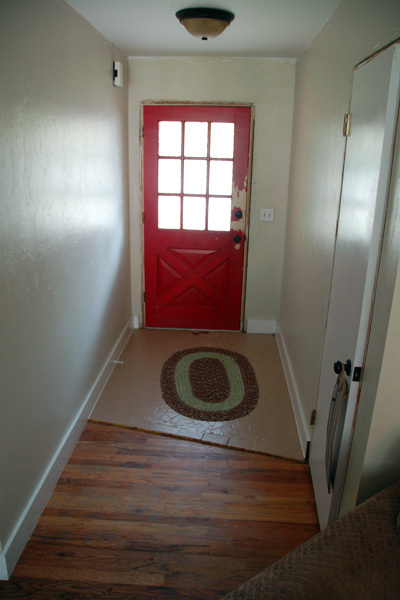 Your idea of faux panels would be really cute too. We did something similar in my kitchen and I LOVE IT....and so do all my kids! It's fun to be able to leave notes for each other! I do love chalkboard paint! Your are a true Visionista! I love your ideas and how you plan things out. You have a vision! I need to take a page from your book & work out a plan for some of my rooms.